EVERYONE HAD A GREAT TIME ON SUNDAY AT THE eGGSTRAVAGANZA FUN DAY. 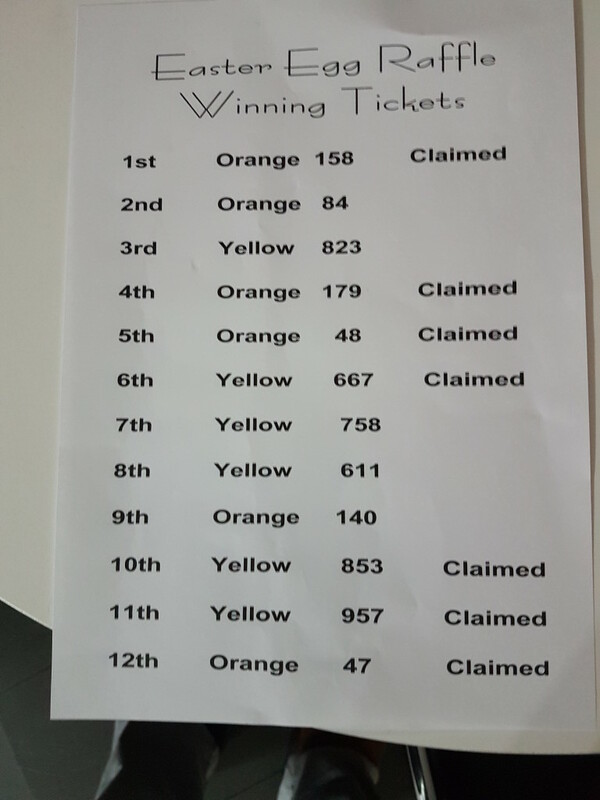 THE LIST OF WINNERS OF THE RAFFLE DRAWN ON SUNDAY NIGHT 1ST APRIL IS PICTURED AND THERE ARE STILL PRIZES TO BE CLAIMED SO PLEASE CHECK YOUR TICKETS AND PICK UP YOUR PRIZE EGG. GOOD LUCK EVERYONE. AND THANKS TO ALL WHO SUPPORTED US ON THE DAY AND BOUGHT TICKETS DURING THE RUN UP TO THE DAY.